We had a bit of cautioned excitement but it turned out to be a false alarm with our mosquito transformation project (link). 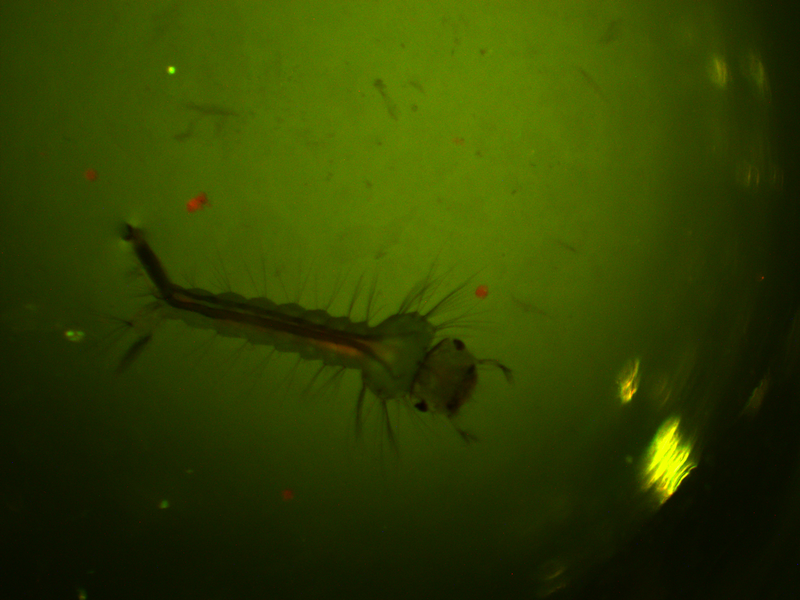 To illustrate, the above image is what we expect to see with the mosquito larvae under UV light. It is dark because we need to minimize the regular light to see the fluorescent pattern; plus we are limited to short exposures because the larvae move around. Three is some autofluorescence in the thorax (green) and gut (red) but in general the head is dark. We were injected a 3xP3 plasmid and we expected a green glow in a band in the head if the germline transformation was successful. At the end of January Jolene found a few mosquitoes that looked like this. 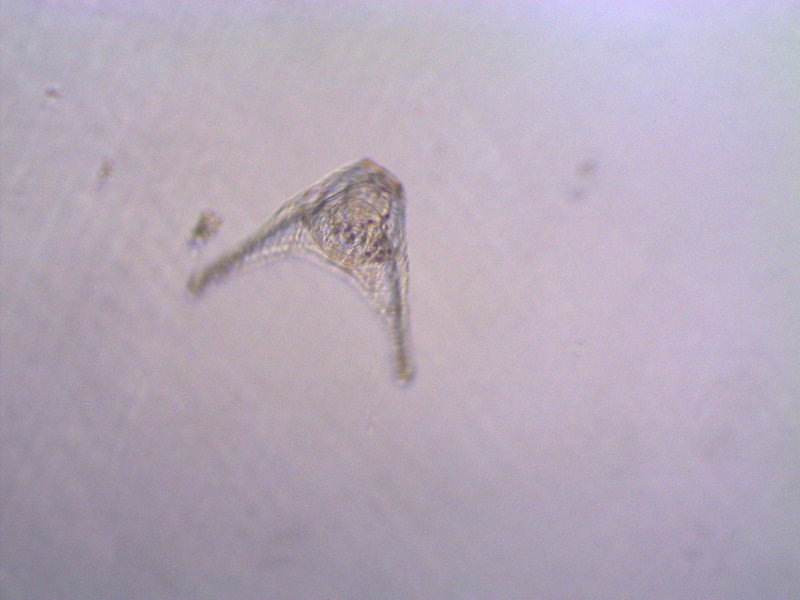 In other news, I showed some images of newly fertilized sea urchin embryos and mentioned ageing them a few days to the pluteus stage (link). We did that but I never showed any pictures. Well here is one, but it is a little fuzzy because the little things zoom around in the sea water scooping up food; this one was rotating so the center is more focused than the exterior. Aki has extracted RNA from them and it is being sequenced by a genomics facility. He currently has over 9 million reads with over 16,000 genes from around the genome identified. I am purposely avoiding posting too much online about his project before he has a chance to analyse and publish the results himself, but here is an image of a tiny part of the genome from his data, less than 16,000 base pairs. 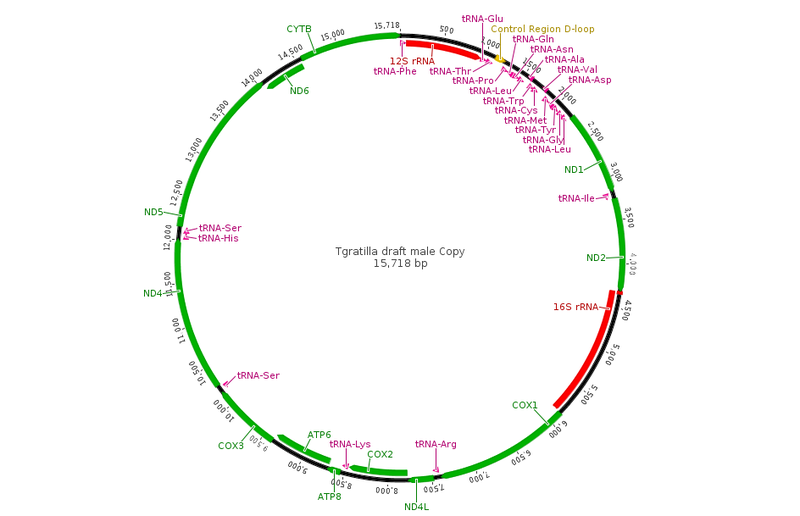 This is the newly sequenced, never seen before, circular mitochondrial genome of Tripneustes gratilla, the collector urchin. If you flatten the DNA out into a linear sequence and map the RNA reads to it you can see the relative expression levels of the different genes (the blue hills above the different features). 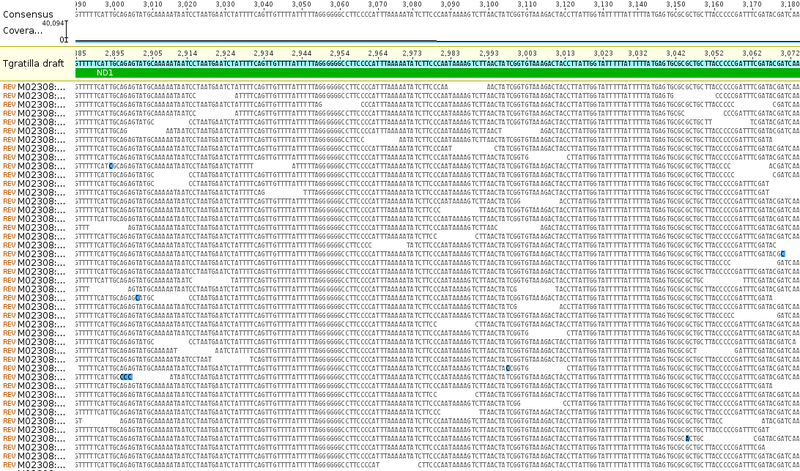 Zooming in you can see the individual sequences that are assembled by aligning overlapping sequences to reconstruct the complete gene sequence. Below is an example from the ND1 gene. 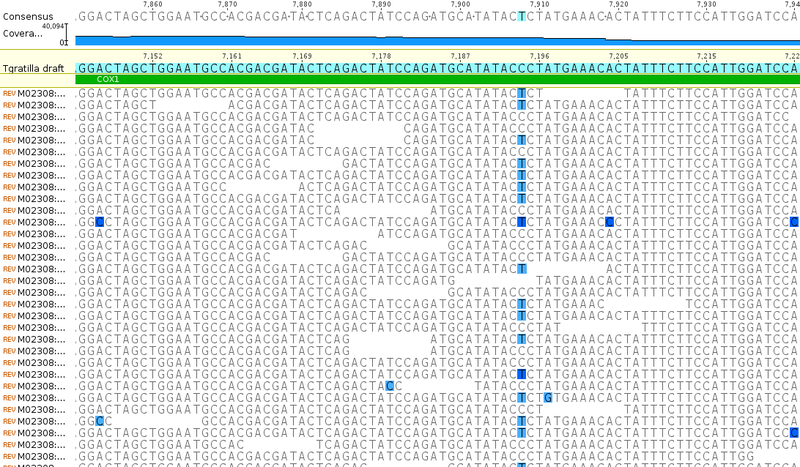 The bases highlighted in blue are disagreements due to occasional sequencing errors. Sometimes these are common however and are due to real genetic variation among the individual sampled. Here is a look at one of these sites, zoomed in even closer, in the COX1 gene. There is a C/T site that is at approximately 50/50 frequency and these sequence reads are made up of a sample from two different individuals. In other words this position is a real genetic difference among individuals that are out there in the population. 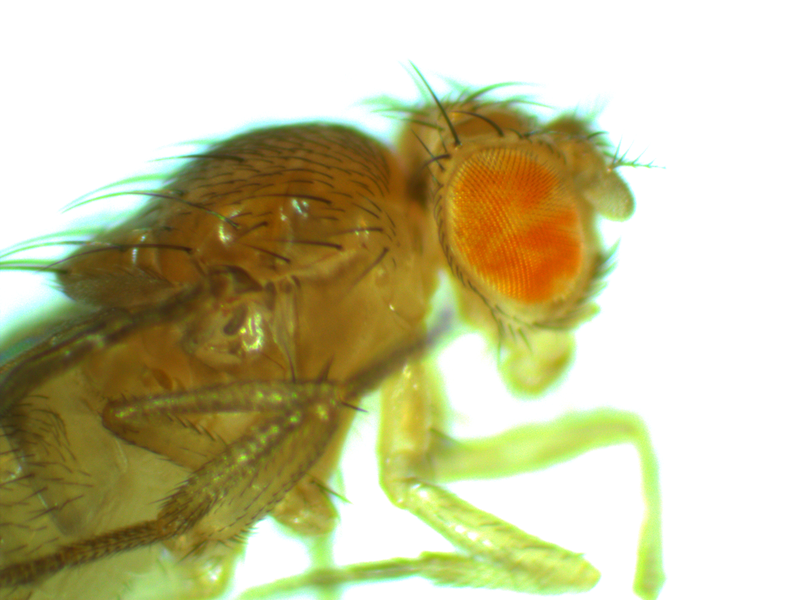 Finally, some time for some Drosophila pictures. 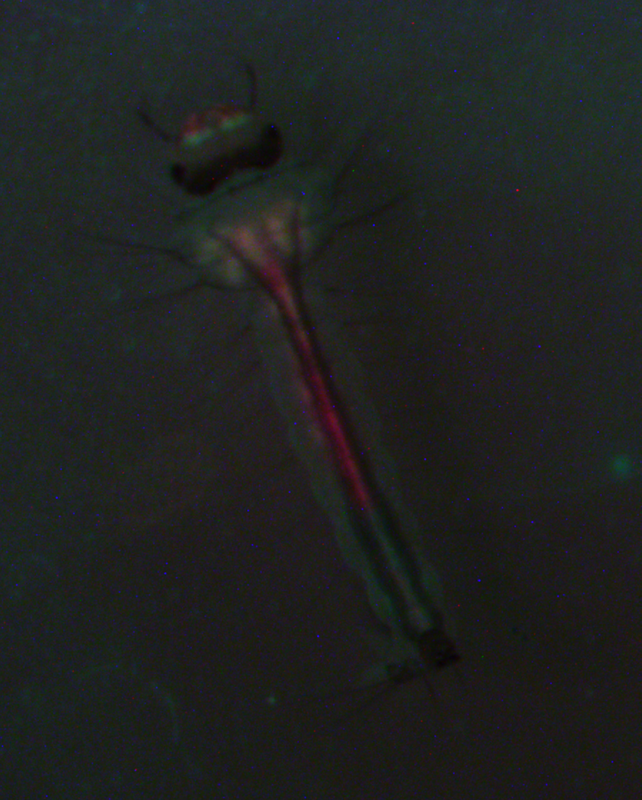 As the FRT/FLP flies emerge from the vial that was heat shocked (link) the mosaic pattern is encompassing larger and larger sectors (for a reminder, the eyes should either be all red or all white because the cells within an organism are (essentially) genetically identical; the cells in these fly's eyes are genetically different from each other). The flies in these pictures were younger at the time of the heat shock (compared to the earlier post) so the cells that had the genetic rearrangement have larger numbers of daughter cells. This gives us some indication of the physical pattern of relatedness of groups of cells on the body and it doesn't always follow what we might expect. 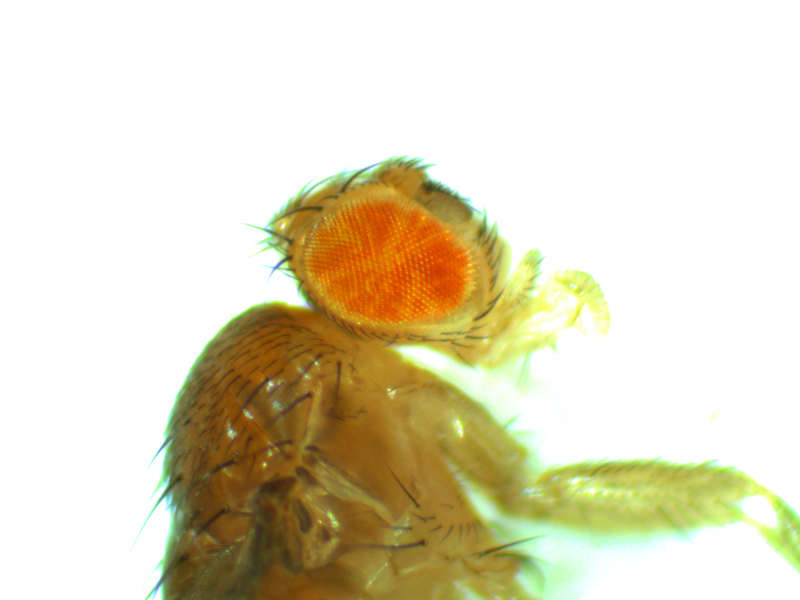 This entry was posted in Drosophila, mosquitoes, sea urchins on March 19, 2015 by Floyd A. Reed. This was done using genetic sequences from a yeast plasmid (the two micron plasmid or plasmid) that are inserted into the fly's genome (pioneered by Golic and Lindquist 1989 (PubMed, Google Scholar)). There is an enzyme called flippase (FLP) that recognizes (binds to) and cuts a specific sequence known as the Flippase Recognition Target (FRT), 5'-GAAGTTCCTATTCtctagaaaGtATAGGAACTTC-3'. In yeast the FLP-FRT system causes rearrangements to the plasmids structure that allow it to amplify in numbers in the cell when the cell undergoes DNA replication (e.g., Chan et al. 2013 (PubMed, Google Scholar)). 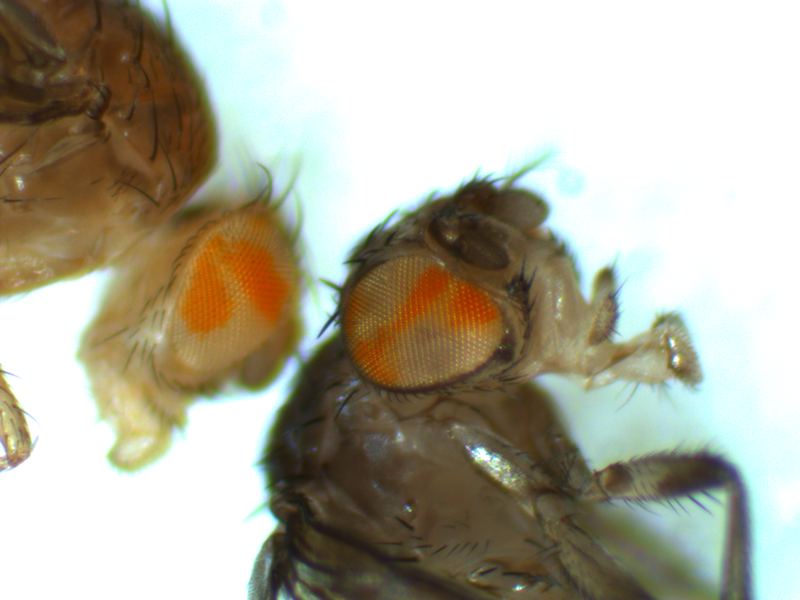 Here in flies the two FRT sites have been positioned on either side of part of the white gene sequence and FLP is placed under the Drosophila heat shock promoter (Hsp70). We exposed the larvae to 37 C temperatures (by immersing vials containing the larvae in warm water for an hour) to induce the expression of FLP by the flies normal gene activation reaction to heat, which then recombined the two FRT sites together and caused inactivation of the white gene, by deleting part of the gene sequence that was between the FRT sites, resulting in a loss of pigment in the cells of the eyes that are descended from cells in which this deletion happened in the larvae. (By the way, a common misconception is that the white gene encodes an eye pigment gene. It does not, but it is in a pathway that is required for the eventual production of several eye pigments in addition to other important molecules.) There are two broad categories of cells that we are interested in here, somatic and germline cells. Only germline cells produce gametes that result in the next generation so only the DNA from germline cells get passed on to the next generation; however, most of the cells in a multicellular animal's body are somatic cells that contain DNA that does not get passed on to the next generation. Ultimately we want flies that have the DNA rearrangement in all the cells of their body. 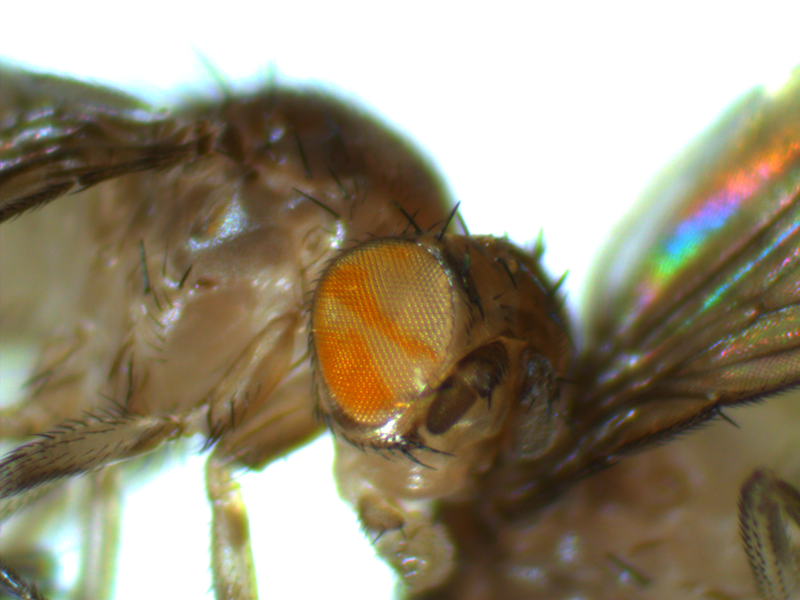 We can see that the FLP-FRT rearrangement worked in some cells by the mosaic pattern in the eyes but we do not know if this has affected the germline of each individual fly. If it has, then any offspring arising from these affected cells will contain the genetic rearrangement in all of their cells (all of the cells will be descended from the same two starting gametes, genetic mosaics of this type should not be able to be passed on from generation to generation). Now we will breed these mosaic flies together and select for all white eyed flies that contain the deletion in all the cells of their body. Then it's on to the next stage of the experiment. 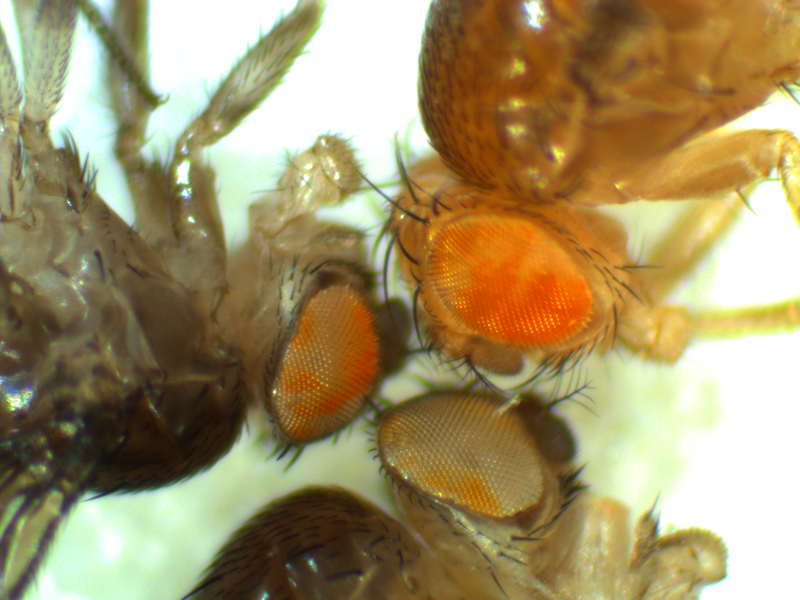 This entry was posted in Drosophila on March 8, 2015 by Floyd A. Reed. AGA Symposium "Origins of Adaptive Radiation"
Floyd A. Reed on AGA Symposium "Origins of Adaptive Radiation"
Floyd A. Reed on Tenure!!! Floyd A. Reed on Difference and similarity: a single gene controls more than one classical evolutionary result.